Get The Heavens Declare episodes 4-6 to learn about astronomy from a Biblical worldview featuring the Solar System, Sun, and Moon. Get The Heavens Declare episodes 4-6 which includes; Our Amazing Solar System, Our Incredible Sun, and Our Wonderful Moon. 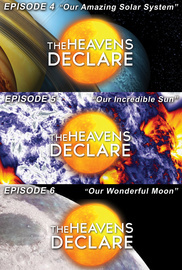 Get episodes 4-6 of The Heavens Declare: Ep4 "Our Amazing Solar System" Ep5 "Our Incredible Sun" Ep6 "Our Wonderful Moon"